Like having a real bassist in your DAW? PRESS RELEASE: Native Instruments today introduced SCARBEE PRE-BASS, a new software instrument that provides a meticulous, highly musical rendition of the iconic Fender Precision bass. 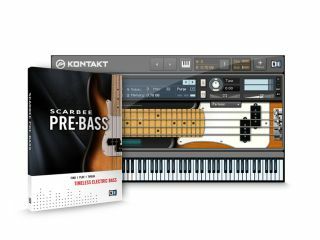 Powered by the industry-leading KONTAKT engine and playable via the free KONTAKT PLAYER or the KONTAKT 3 sampler, SCARBEE PRE-BASS delivers the full sonic spectrum of the most popular bass guitar of all time, suitable for a universal array of musical styles from pop and rock to hip-hop, jazz, funk and beyond. All four strings of the original instrument have been expertly sampled in nine velocities, resulting in over 4,000 individual studio-grade samples. The sample material was recorded through a DI for maximum sonic flexibility, using round-wound strings for a bright and punchy sound. Specific "Player Profiles" for various genres as well as EQ and effect controls allow musicians and producers to further customize the sound and behavior of PRE-BASS to fit the musical context. To preserve all the acoustic intricacies of the real instrument, PRE-BASS takes full advantage of the unique scripting features of KONTAKT, resulting in a performance that is virtually indistinguishable from that of a real professional bassist. Authentic articulations and playing techniques include hammer-ons, pull-offs, grace notes, various trills, mutes, harmonics, pickup hits, fret noises and much more, most of which are automatically triggered based on the incoming note material. The fretboard display in KONTAKT and KONTAKT PLAYER shows the playing position and articulation of each note in real-time, with intelligent string selection and index finger/middle finger alternation as well as dedicated slide and chord modes that contribute to the unparalleled authenticity of the instrument. SCARBEE PRE-BASS is available for download purchase in the NI Online Shop for $89 / 79 Euro.